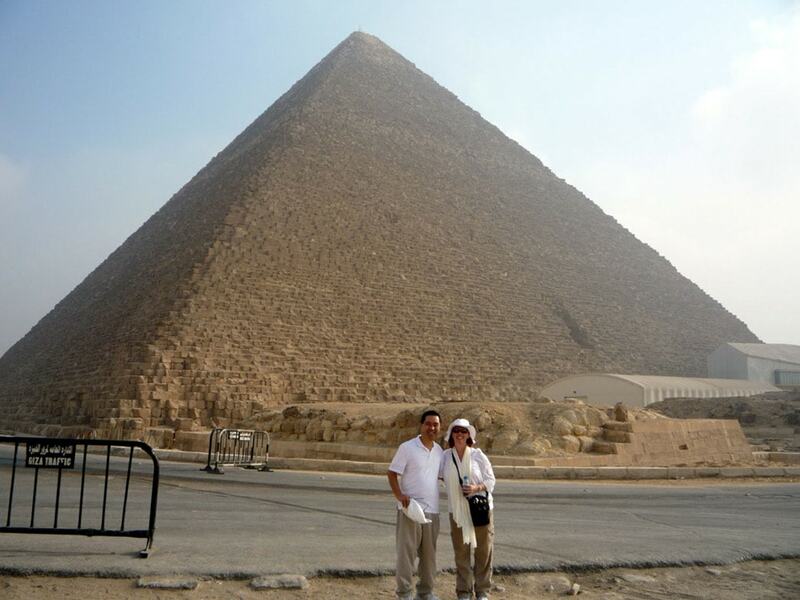 Hubby and I recently took a trip to Egypt, one we’d been planning for some time and a place both of us had wanted to visit since childhood. 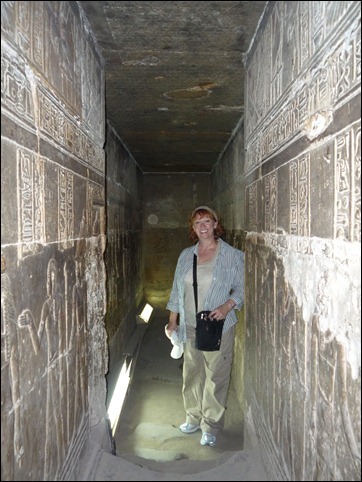 Of all the places we’ve visited around the world, Egypt is one of my favorites and continues to influence me in various aspects of my life, including my writing. Our itinerary included famous sites in and around Cairo and Luxor and even now it seems surreal that we were actually there. One tap, mainly used for pedestrians – I’m bigger so get out of the way! Two taps – Look out other cars, buses, donkeys and trucks, I’m coming through. One long blast – Hey, buster, you’re drifting into my area. Watch it! A series of toots – Howdy, everyone, how’s it going? After that entertaining ride from airport to hotel, we were greeted with a fabulous view of the Nile River from our balcony. Surreal to think we were finally in Egypt, where ancient Pharaohs had once ruled. Jetlagged from the long trip, we ate, we slept, and we awoke ready for our adventure. The next morning Mohamed took us to Giza to visit the pyramids and sphinx. Not only is it humbling to stand in the shadows of these massive structures from a five-thousand years ago civilization, but squatting, hunching, and crawling through hot pyramid chambers is a feat in itself, and one I wouldn’t have missed. Sadly, cameras aren’t allowed in these chambers anymore but visitors can take as many photos as they want from the outside. Here, we also met friendly Egyptian characters eager to yak it up with strangers. After crawling out of one of the hot pyramid chambers, hubby and I were laughing about something. I honestly don’t remember what. Maybe we were just punchy from the heat. Anyway, a friendly Egyptian man stepped to us and said to my husband, “You have good wife. She worth a million camels.” Not knowing the exchange rate for a million camels, I chose to believe this was a goodly amount and laughed again. The man grinned and repeated his statement, patting me on the shoulder, satisfied that we understood his flattery. Like I mentioned before, friendly characters eager to chat. Another day of our adventure took us into Dendara (Dendera), which is full of history from ancient Egyptians, Romans, Greeks, and even Ptolemy. All of these peoples are said to have made alterations to the temple and even built additional structures here. We arrived before any tour buses and got a chance to walk around this area while it was quiet. I’m not fond of crowds so this made the area all the more special. 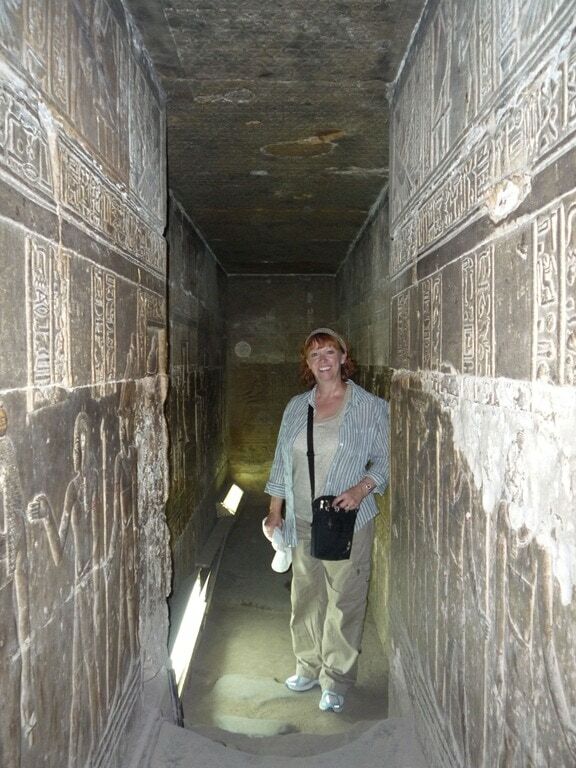 Here we encountered giant columns and walls filled with ancient hieroglyphics. You can see some of the original paint colors here, too, a fabulous glimpse into the ancient world. We even had a chance to walk into some of the underground tunnels, where ancient Egyptians decorated everything with hieroglyphics, another reason I love them so much. We visited the oldest pyramid in Saqqara and stopped to admire giant statues in Memphis before flying on to Luxor for the final half of our adventure. Valley of the Kings is probably the most well-known place in Luxor. 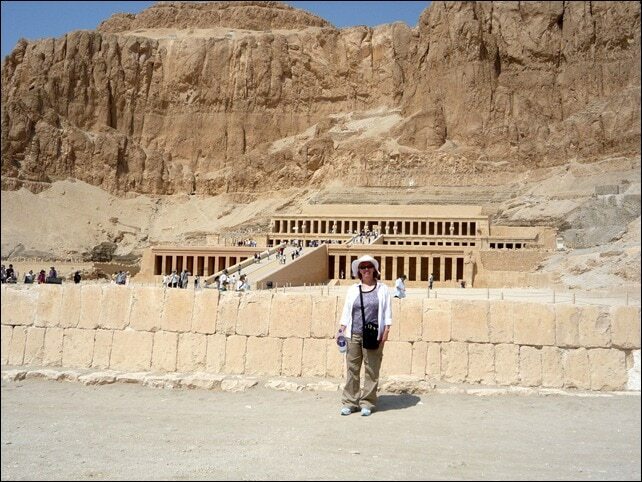 Famous tombs are preserved here, including those of Tutankhamen and Ramses (Ramesses) II and III. The colors in some of these tombs are so well-preserved, you’d think they were painted recently, but some are over three-thousand years old. Three-thousand! While that’s a blip in geological time, it’s huge for us mere humans. And a topper to this ancient Luxor cake is King Tut’s mummy. Yep, his actual mummy is in his tomb. We stood right next to it. Unfortunately, cameras are no longer allowed inside, but there are plenty of pictures on the internet from people who were lucky enough to travel to Luxor before this camera ban. As a woman who writes novels with strong female characters, I’m always interested in females throughout history, especially those in ancient times. The most important female Pharaoh, Queen Hatshepsut, once reigned in Luxor. She dressed in traditional male garb and created obelisks that her father had begun, adding her name to them. She was also erased from history. At least for a while. We were told she stole the throne from her young stepson, him being the male heir and all, and it really ticked him off, so he later attempted to erase her existence. But I also think the patriarchal society back then had much to do with this, especially since Hatshepsut accomplished a lot during her twenty-year reign. Those that came after her even went so far as to encase her obelisks in stone. Luckily for us, Egyptologists rediscovered these obelisks, as well as other information, and added her back into the history books. Her temple still stands in Luxor today. Yea, Hatshepsut! You go girl! Today, we see only remnants of ancient Egypt, ravaged by time and worn down into massive monuments of bland, sandy monotony. But these monuments were once full of vibrant colors and artwork that I’m sure took many an ancient visitor’s breath away and helped establish Egypt as the world power of its time. I know I was impressed. And after this fabulous trip, I am most definitely influenced by the grandeur of the ancient Egyptians, especially in my writing. The modern ones also have taken special a place in my heart. After all, I’m worth a million camels. Dana Davis is an award-winning and bestselling author, paranormal investigator, world traveler, former Hollywood stand-in/photo double/dancer, wife and chocoholic. She writes because her head would explode if she didn’t. When she’s not writing, she loves to read, swim, hike, travel, peruse graveyards and ruins, and investigate purportedly haunted locations. Dana lives in the west with her husband and two insane birds, where she is currently writing another book. What Does A Kid Do For Four Days In The Desert? – www.TravelswithaNineYearOld.com is currently traveling in Egypt, collecting some of the most amazing interviews, but this post, from the kid’s point of view, is incredible. 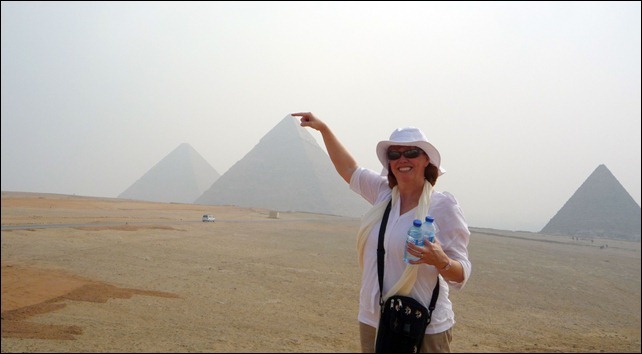 Loved refreshing my memory on your trip to Egypt. The explanation of the horn ‘toots’ were funny and informative. I remember gazing (and losing myself) in pictures of the Sphinx when I was in high school. He looked so much different then. He is less complete now…. I had no idea that Tut was still in his tomb. I thought they had removed him, and eventually taken him apart in a laboratory somewhere. I am glad to hear he is resting peacefully –where he should be. Here’s a poem I learned from my father (about a hundred years ago)….. The sexual desires of a camel, are greater than anyone thinks. 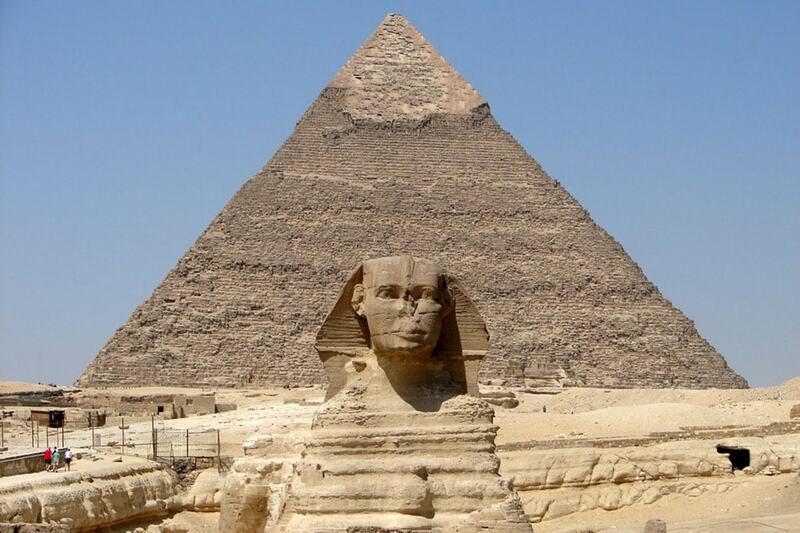 One night, in a fit of passion, he tried to make love to the Sphinx. And accounts for the hump on the camel, and the Sphinx’s inscrutable smile. You’re a hoot, Susan! I was surprised to see old Tut in there, too. Wish we’d made it there before photo ban. A friend gave us copies of his Tut photos from a few years ago so at least we have something physical to remind us. Thanks for reading!